So last week we couldn't swim at Parnell because there was not enough water, this week we couldn't swim because there was too much water!! The bad weather we had over the weekend caused heaps of flooding and took Parnell out for almost 5 days which is pretty bad for them (and for us of course...). So we ended up back at Youthtown but no canoodling couples this time thank god. 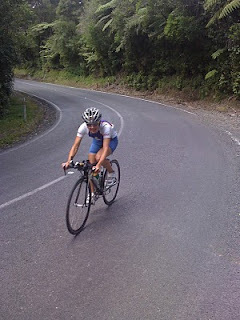 The sea swim was Haydn's Kohi swim series where I sunk to a new 2000m low. I am getting slower and slower, its really quite depressing. It was pretty choppy on the way back though, I honestly felt like I was being tossed around in a washing machine. It was lucky that Tour de Ranges wasn't a week later otherwise I think it would have been canceled because the road was pretty bad. 5 runs this week!!!! Got a little bit scared on the 3rd in a row so had to pull it back a bit but overall its been pretty good. Did 1hr35 as my longest so I should be able to get 2-3 2hr+ runs in before IMNZ which will hopefully be enough. I wouldn't normally do much more than that with a perfect build up anyway. I have swindled myself a Garmin 110 from my dear friend Lesbo to use up until Ironman so am pretty excited to see what the fuss is all about. Got myself a new pair of shoes (adidas Supernova Sequence Jnr) which I promptly bled all over on the heel. I think it was more related to tape I had to stop my cycling shoes from rubbing which then got in the way while running and caused a blister because the first couple of runs were fine. I would like to wear my K-Swiss K-ona's more but they are just a bit wide in the forefoot for me and my forefoot moves around too much. Which is very sad because I do love them but I just don't think that we are destined to be together. Big training weekend in Taupo next weekend with our boyfriend Kezzle-Anne. I can't imagine all the cuss and dirty words which will be coming out of my mouth after spending a whole weekend with him. Check out the produce from my garden.